Abstract: ARCENE's task is to distinguish cancer versus normal patterns from mass-spectrometric data. This is a two-class classification problem with continuous input variables. This dataset is one of 5 datasets of the NIPS 2003 feature selection challenge. The data were obtained from two sources: The National Cancer Institute (NCI) and the Eastern Virginia Medical School (EVMS). 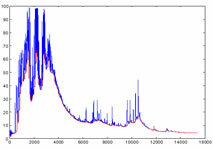 All the data consist of mass-spectra obtained with the SELDI technique. The samples include patients with cancer (ovarian or prostate cancer), and healthy or control patients. ARCENE was obtained by merging three mass-spectrometry datasets to obtain enough training and test data for a benchmark. The original features indicate the abundance of proteins in human sera having a given mass value. Based on those features one must separate cancer patients from healthy patients. We added a number of distractor feature called 'probes' having no predictive power. The order of the features and patterns were randomized.